Since the alien army vastly outnumbers the team, players must use the post-apocalyptic world to their advantage, such as seeking cover behind dumpsters, pillars, cars, rubble, and other objects. I want to resize the UILabel's height so that the text can fit in. I'm using following properties of UILabel to make the text within to wrap. Please let me know if I'm not heading in the right direction. Thanks. //adjust the label the the new height. In iOS 6 Apple has added a property to UILabel that greatly simplifies dynamic vertical resizing of labels: preferredMaxLayoutWidth. Using this property in combination with lineBreakMode = NSLineBreakByWordWrapping and sizeToFit method allows easily resize a UILabel instance to the height that accommodates the entire text. preferredMaxLayoutWidth The preferred maximum width (in points) for a multiline label. Discussion This property affects the size of the label when layout constraints are applied to it. During layout, if the text extends beyond the width specified by this property, the additional text is flowed to one or more new lines, thereby increasing the height of the label. status.numberOfLines = 5; // limits to 5 lines; use 0 for unlimited. status.preferredMaxLayoutWidth = self.frame.size.width; // assumes the parent view has its frame already set. Instead doing this programmatically, you can do this in Storyboard/XIB while designing. Set UIlabel's number of lines property to 0 in attribute inspector. Then set width constraint/(or) leading and trailing constraint as per the requirement. Then set height constraint with minimum value. Finally select the height constraint you added and in the size inspector the one next to attribute inspector, change the height constraint's relation from equal to - greater than. Step 4 :- Most tricky give botton to UILabel from UIView . Note :- Make sure you have set Number of lines =0 in Label property. I hope this info enough to understand Autoresize UIView according to UILabel's height and Autoresize UILabel According to text. //  Created by Vijay on 24/02/14. //  Copyright (c) 2014 http://Vijay-Apple-Dev.blogspot.com. All rights reserved. Since sizeWithFont is deprecated I use this one instead. this one get label specific attributes. Also use NSString's sizeWithFont:constrainedToSize:lineBreakMode: method to compute the text's height. The easiest and better way that worked for me was to apply height constraint to label and set the priority to low, i.e., (250) in storyboard. So you need not worry about calculating the height and width programmatically, thanks to storyboard. No more weird layering. If there is a better way to handle this, Please let me know. yourLabel.text = "your very long text"
The interesting lines are sizeToFit() in conjunction with setting a frame.size.height to the max float, this will give room for long text, but sizeToFit() will force it to only use the necessary, but ALWAYS call it after setting the .frame.size.height . I recommend setting a .backgroundColor for debug purposes, this way you can see the frame being rendered for each case. One line is Chris's answer is wrong. Other than that, it's the correct solution. Finally, it worked. Thank you guys. cell.myUILabel.text = @"Some very very very very long text....."
myLabel.text = "your very long text"
My approach to compute the dynamic height of UILabel. // Font of this label. // A dummy label in order to compute dynamic height. This can be easily achieved via storyboard. 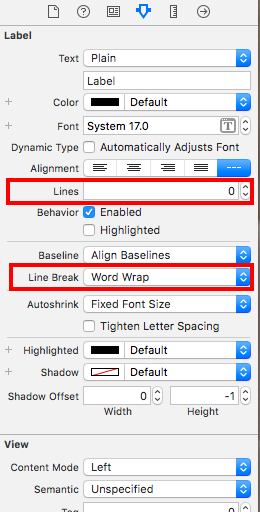 Set Line Break to WordWrap in Attribute Inspector. Not the answer you're looking for? Browse other questions tagged ios cocoa-touch uikit uilabel or ask your own question. 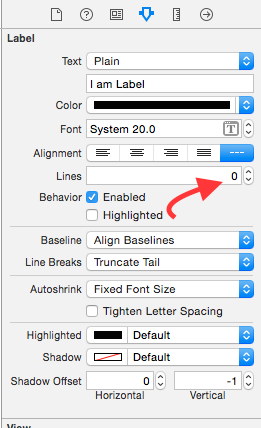 Replacement for deprecated sizeWithFont: in iOS 7? Sizing a UILabel to fit? How do you add multi-line text to a UIButton?